Marketing a legend. Priscilla Presley & Yoko Ono both married the most famous entertainers Elvis Presley and John Lennon. Both, Priscilla Presley & Yoko Ono became single mothers. Both took up the torch, honed their business skills and ran all the way to the bank? Several decades ago, two raw talents picked up their guitars and altered the planet forever. Both have since attained international deity. John Lennon’s deity had been given it proper place in musical and cultural history. However, Elvis Presley’s impact seems to have been lost amidst his legend. The distinct contrast between the legacies of these consummate entertainers can be attributed (over and beyond the myths) to their widows, Yoko Ono Lennon and Priscilla Beaulieu Presley. Two distinctly different women who married two legendary entertainers two years apart (Elvis and Priscilla in 1967 in Las Vegas Wedding Photos John and Yoko in 1969 in Gibraltar) and have since become two most famous widows in the world today. Over the past 30 years these two widows have unwillingly been keepers of the flame. Both have had to face the challenge of surviving beyond the myth, the mania and the madness, while the juggling millions of dollars and motherhood, and honeing their marketing skills, but that’s where the duality beings and ends. In England, the youthful, John Lennon who saw Elvis as his hero, became obsessed by this image and lusted after that power. “I wanted to be this tough James Dean, but Elvis was bigger than religion in my life,” Lennon said. In death John’s legacy seems to have retained what was stripped away from Elvis. Today we accept Lennon for what he was, have forgiven him for his public acts of vulgarity, his plight to be taken seriously, and still love him. Unlike Lennon, the public has never forgiven Elvis for what they think they know about his private life. In 1963, when the Beatles burst on to the scene, playing their gig in suits and ties parents saw beyond the neat image and hated them for being the treat the Elvis ceased to be. But the clean-cut image soon gave way to rebellion, challenging authority, drinking, drugging, and debauchery in a bid to search for their souls. In the process they changed the world and helped put an end to the Vietnam War. The public will never know what Elvis was doing behind closed doors, no one will, because he never told his side of the story…. Since his death we have had only hearsay accounts telling us what Elvis (inside Graceland) was doing privately what all his critics were doing publicly. In 1967, when Priscilla Beaulieu changed her name to Presley and the 38 years since she has been publicly portrayed as the soft-spoken, China-doll who did her best under an untenable situation. Even her autobiography, ELVIS AND ME could not account for Elvis’ prowess, or why he couldn’t balance his bank book or what caused his drug crazy decline. Oh, we know she took karate lessons, rode horses, and endured his countless infidelities. 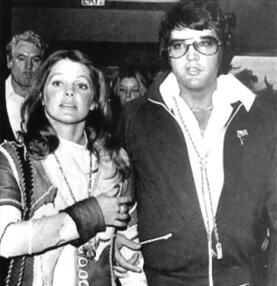 However, when Elvis finally accepted the responsibility for his waning career, she walked. By not naming Cilla in his last will and testament we know Elvis never intended his ex-wife take charge of his estate. Only three years after Elvis’ death Priscilla employed a team of business marketing consultants and turned Graceland from a lemon into lemonade. Today, the Graceland mansion, her family home, is the most successful real estate marketing product since the Eiffel tower was built. He left that to his father, Vernon to be passed on to his daughter, Lisa Marie at age 25. Suddenly even Elvis’ last wish was amended by Priscilla hand in 1990 when she coaxed her daughter to postponed her inheritance till she turns 30 in 1998. She walked by his side everyday, understood and encouraged his artistic growth. And when John self-destructed under the pressure of his career, Yoko played the devils advocate. She weaned him off drugs, guided him towards a healthy diet and became his partner in inner peace. An astute businesswoman, she can be credited for investing John’s income and turning it into a fortune – without the need to be called Yoko Lennon. When Elvis was alive, he and Cilla kept the details of their marriage to themselves. Only after his death we got to hear her side of ‘their’ story. Whereas, John and Yoko lived out every marital blow via the media with no sin left unturned. 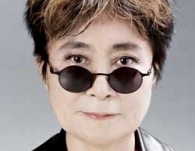 Yoko has never written a book, never once complained about the hardships of being wed to a famous entertainer. Clearly, Priscilla Presley will always be termed the rock n roll widow, exploiting Elvis’ (after death) image to the tune of the cash register’s motto: never give away anything you can sell. Whereas, rock n roll survivor seems better suited to Yoko Ono whose business marketing acumen (during Lennon’s lifetime) had her investing in real estate and farming reaping a 16 million-dollar profit in 2 years. Priscilla is often credited for Elvis’ estate today being worth 100 million dollars. Little known fact is that Jack Soden approached Cilla with an offer to good to refuse. Today Soden CEO of EPE Inc is laughing all the way to the bank. Without the financial perks of a John Lennon ashtray, aftershave or toothpaste, John’s estate is currently estimated to be worth one billion, but you don’t hear Yoko boasting. When Priscilla saw fit to expose the grim details of what it was like to be wed, live and then divorced the King, she elected herself the producer (with no experience) for the tele-movie based on her autobiography. With her producer’s learners permit, her perception gave us a Elvis persona so shallow, so debauched and so blown away on drugs, no friend, fan or foe could recognize. However, when Yoko decided to reveal John’s personal life, she gave professional producer, David Wolper 240 hours of personal film archives which he in turned into a haunting in-depth representation as to why John’s persona reached deep into our souls with the documentary aptly titled, IMAGINE. But the ultimate legacy of either star is how their offspring have been taught to handle the weight of being born famous. 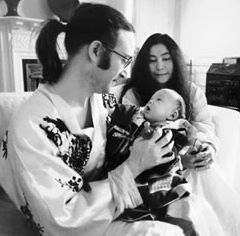 Both Priscilla Presley & Yoko Ono raised their children as single parents. Priscilla has extruded that sympathetic aspect for all it worth, with the enduring claim that she’s the mother of Elvis Presley’s only child. Yoko did it without complaint. The result! Sean Lennon was sent to school in Europe to mature into a normal healthy teenager. Today his public appearance to accept awards on behalf of his father show he has control of his birthright situation. He gladly mingles with his father’s fans. Treats the media and curiosity seekers with the wit of both his parents – despite the fact he was only 5 years old when his father died. On the other hand, Lisa Marie Presley never mixes with Elvis fans. Her interviews are rare. Her public appearances are manipulated to promote her mother’s career. If Lisa has any memory of the man who handed her the world on a silver platter she has done nothing to stop the critics or discredit any of the bizarre media claims. The most evident contrast between both heirs apparent, Sean and Lisa came to light in June 1989 and again in 1992. When Lisa sold photos of Elvis Presley’s first grandchild, Danielle and grandson, Benjamin to the highest bidder while claiming they were a private family. And whenever the paparazzi catch her outside the strict environment of her mother’s control Lisa Marie frowns and flags her middle finger and curses the world.